I arrived with my daughter and her friend, both aged nine, at a fairly full Festival Theatre, mingling with a mixed bunch of parents and children mainly aged six and under. The show we sat down to was introduced by our host for the next hour Shaun Morton. The journey begins with our host introducing us to the smaller dinosaurs moving gradually onto the slightly scary Tyrannosaurus Rex for the grand finale. The great thing about the show was the constant audience participation. 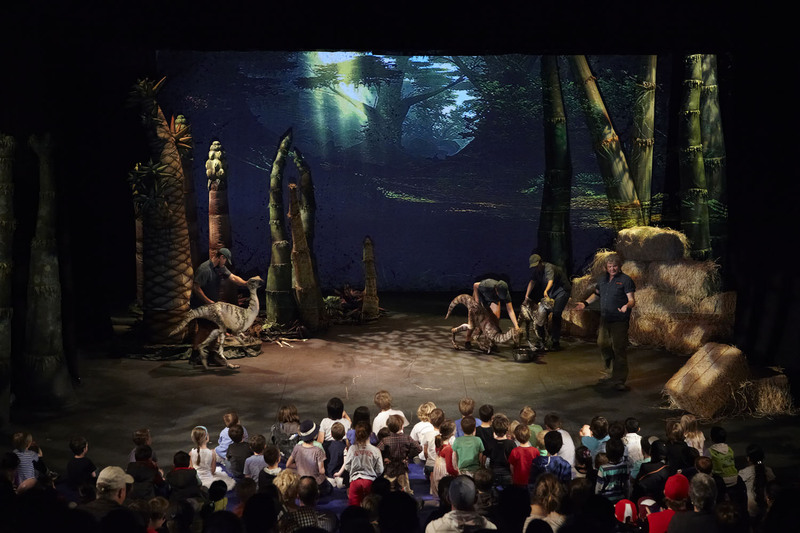 Shaun Morton manages to engage the audience at all points – the adults with his quick wit and the children with his enthusiasm and knowledge, The show is clearly aimed to be educational as well as fun, with lots of interesting facts about how dinosaurs interacted with each other and their environment through the ages. Posted on September 20, 2015, in Uncategorized. Bookmark the permalink. Leave a comment.